It's the concept Hollywood directors and producers just don't seem to fully understand -- Americans don't want to spend their hard earned money on movies insulting their values. 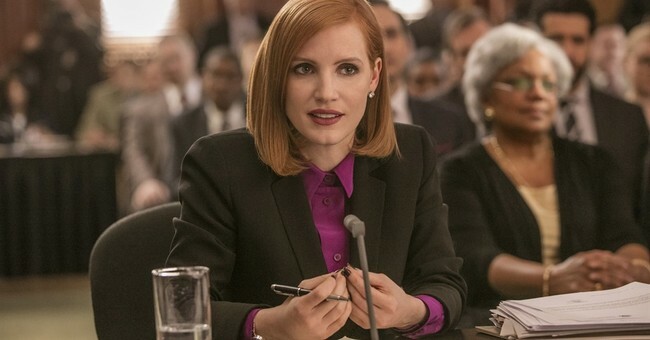 Miss Sloane, the latest progressive movie starring Jessica Chastain, is about taking on the National Rifle Association, portrays gun owners as unhinged and advocates for universal background checks and gun control. It tanked at the box office opening weekend and is the latest example of Hollywood's elitist disconnect with the rest of the country. The film, which premiered in select cities on Thanksgiving, hit more theaters this past weekend, and it fizzled in its wide expansion, earning $1.9 million from 1,648 locations. According to Deadline, “Miss Sloane” cost $13 million to produce. It currently has a score of 69 percent on review aggregator Rotten Tomatoes. The movie was projected to earn a paltry $5 million at the box office, according to the Los Angeles Times, but so far it’s fallen short. Not surprisingly, the film is still up for a Golden Globe award despite bombing with regular Americans who buy movie tickets. Meanwhile, enough guns were purchased on Black Friday to arm the United States Marine Corp. andsupport for new gun control measures are at an all time low.